With radiance and high energy as a constant, you can cultivate an inner attitude of victory, do great things, and seize the day! Be vital and shine like the sun! Transform your body and your life! Experience fun fitness that you will always love to do. Here is the best of both worlds: Kundalini Yoga's spiritual depth and energizing aspects, with complete total body fitness. This DVD presents short fun sets to help you get everything covered, everyday, in every way. You can do these segments individually or as one long set. 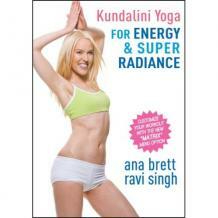 Kundalini Yoga s more than skin deep approach allows you to redefine yourself from the inside out!